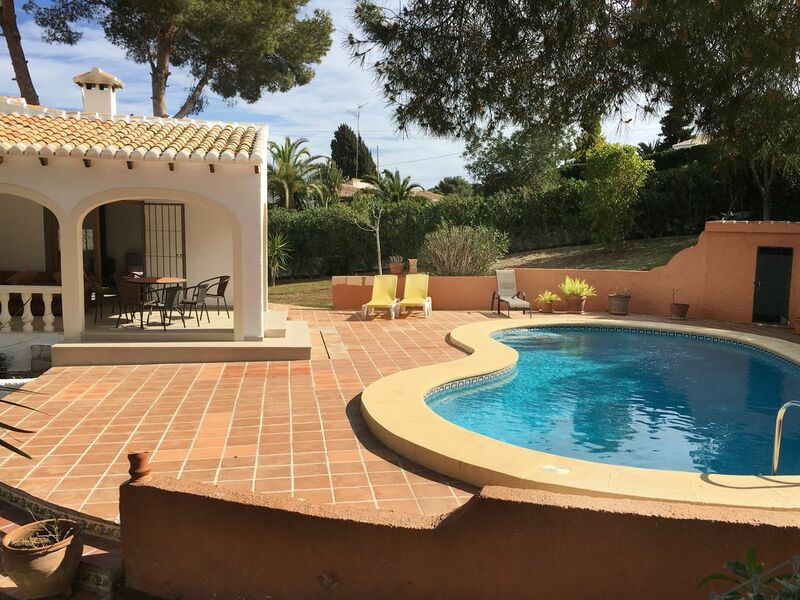 A beautifully appointed villa in the prestigious area of Tosalet, 2km from the sandy beach of Jávea. However, whilst being close to a wide range of amenities it is blissfully quiet and, if you prefer, you can spend the holiday enjoying the delights of the garden and private pool. (10m x 4.5m, kidney shaped, depth 1.9 to 1.0 metre). We came on a villa rental holiday to Javea in 1998 and fell in love with the place. Long story short we bought this place the same year and have wonderful family holidays here every year since. It's a home from home, but where the sun always seems to shine! Lounge/dining room with wood burning stove and 39 station digital satellite TV (stations include BBC1 and 2, Sky Sports 1 and 2, ITV1, Eurosport, UK Gold, Sky One, Sky Film Premiere, Discovery, Sky News, CNN, CBeebies, BBC Prime). Well equipped kitchen with electri oven and hob, microwave, fridge/freezer, washing machine and dishwasher. Locally there is golf (including a golf course designed by Seve Ballesteros). Notes on accommodation: The villa is prepared for your arrival and cleaned after you depart. The pool and garden are permanently maintained. We ask for no smoking inside the villa. The villa has central heating for off season rental. Pets on application Outside: Covered naya overlooking the pool, barbecue, drying terrace and carport. Cleaning / Towels / Linen / Maid service: Linen is supplied with the exception of beach towels. The beach is 2km. distance. Alicante airport is 90km or Valencia airport is 115km. Javea is an exclusive resort. The old town and port is situated next to a long sandy beach fringed with orange groves and set against the backdrop of the Montgo mountain. Apart from the magnificent setting, Javea offers a superb choice of fine restaurants and bars as well as an excellent choice of water sports, 2 golf courses and a range of other leisure activities. There is a supermarket about 5 minutes walk from the villa. Javea town is approximately 2km away and has a sandy beach, shops and many restaurants. There are many places of historic interest to visit and, in the evening, alongside the beach and restaurants is a street market selling arts and crafts. Local sports include: tennis, water sports, golf and go-karting. Javea is located in beautiful mountain scenery and there are many walks and some breathtaking views. According to the World Health Organisation, Javea has a near perfect climate as a result of its proximity to the mountains.